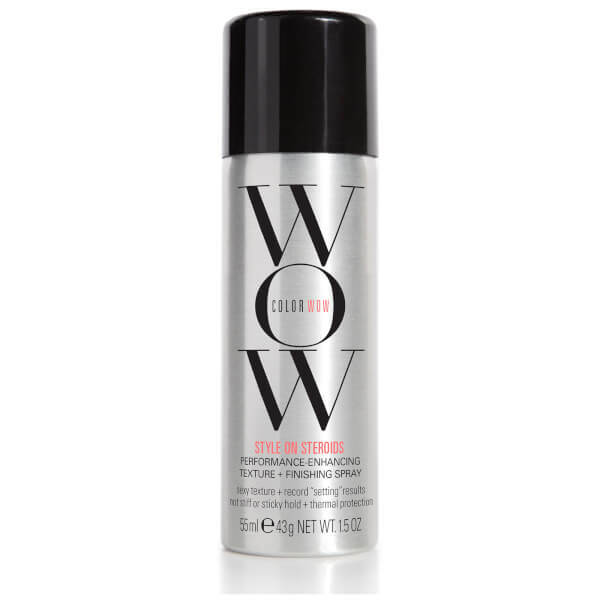 Add enviable texture to colour-treated hair with the travel-sized Color WOW Style on Steroids Performance Enhancing Texture Spray; a unique finishing treatment designed to be spritzed onto dry locks. Effortlessly misting over hair, the undetectable spray is able to add instant texture, without leaving tresses chalky and clouding colour’s vibrancy. The texturising formula is infused with Micro-Zeolites and moisturising Elastimers, which work in synergy to add grit, grab and style memory to hair prior to styling. Without leaving hair stiff, sticky or brittle, the hair spray keeps styles flawlessly held, without masking colour. Expect tousled texture. Hydrofluorocarbon 152-A, Butane, Alcohol Denat. , Vp/Va Copolymer, Trisiloxane, Peg/Ppg-17/18 Dimethicone, Zeolite, Glycerin, Acetyl, Triethyl Citrate, Fragrance (Parfum), Butylphenyl Methylpropional, Citronellol, Hydroxyisohexyl 3-Cyclohexene Carboxaldehyde, Linalool, Hexylcinnamal.